Also Called: Horse gentian, tinker's weed. Stems: Erect, unbranched, not prickly, densely glandular-pubescent. Leaves: Cauline, opposite, simple; petiole absent or essentially so; some or all leaves strongly connate-perfoliate especially medial ones; blade oblanceolate to obovate or elliptic, sometimes fiddle-shaped, 3.2 to 8.8 inches long, .5 to 3.2 inches wide, base of non-perfoliate blades cordate to tapered, margins entire or shallowly lobed, apex acuminate. Inflorescences: 1- to 4-flowered clusters, axillary; bracts 2. Flowers: 1 to 4 per axil; calyx lobes 5, linear to linear-lanceolate, .4 to .7 inch, uniformly glandular- and non-glandular-pubescent; corolla red to reddish purple, sometimes greenish yellow, 5-lobed, .4 to .7 inch, funnelform, glandular-pubescent; stamens 5, anthers included; style capitate, exserted. Fruits: Berries, orange to reddish orange, .27 to .43 inch, crowned by persistent calyx; nutlets 3, .15 to .35 inch, longitudinally ribbed. Habitat: Floodplain woods, mesic oak-hickory woods, glades, bluffs, thickets. Comments: Triosteum, three + bone, alluding to the three bony seeds in each fruit and perfoliatum, through + leaf, alluding to the pairs of leaves united at their bases, with the stem seeming to grow through them. This species is known by various common names: horse gentian, wild or wood ipecac, tinker's weed, wild coffee, horse ginseng, white gentian, and feverwort. The name wild coffee is derived from German settlers in Pennsylvania using the dried and roasted fruits as a substitute for coffee. Feverwort came from the early practice of using an infusion of the leaves to increase secretions and induce sweating in cases of intermittent fever. The name wild or wood ipecac came about because a decoction of the plant was found to have the well-known emetic effects of ipecac. Horse gentian, horse ginseng, and white gentian originated because Triosteum was sometimes used as a tonic, substituting for the officinal European yellow gentian. 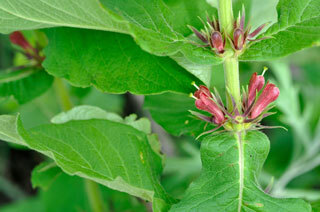 Tinker's weed was named for a New England doctor who used the plant in his medical practice.